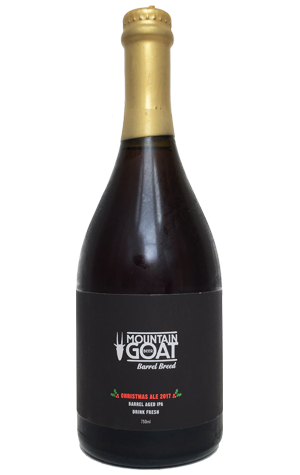 Of Mountain Goat's Barrel Breed lineup, it's been their Christmas release they play around with the most. The first was what you might call a traditional Christmas beer: a big, dark, fruity Belgian number. Last year, it was a refined Belgian strong golden ale and, this time around, they've left Europe entirely and released a barrel aged triple IPA that could as easily be tagged an American barley wine. The base beer was the same recipe as the brewery's Trip Trap Triple IPA then aged for three months in fresh American whisky barrels. And, while the time in oak has impacted the beer, you can still pick up distinct piney aromas from the Columbus, Centennial, Amarillo and Simcoe hops, at least if you drink it fresh over Christmas. They play just one part, however, in a beer that's voluptuous of body and luscious in nature, awash with vanilla, clotted cream toffee, stewed fruits and sweet alcohol, kept in shape by the hop bitterness. We suspect your guests will thank you if you pull one out with the brandy snaps on the big day.